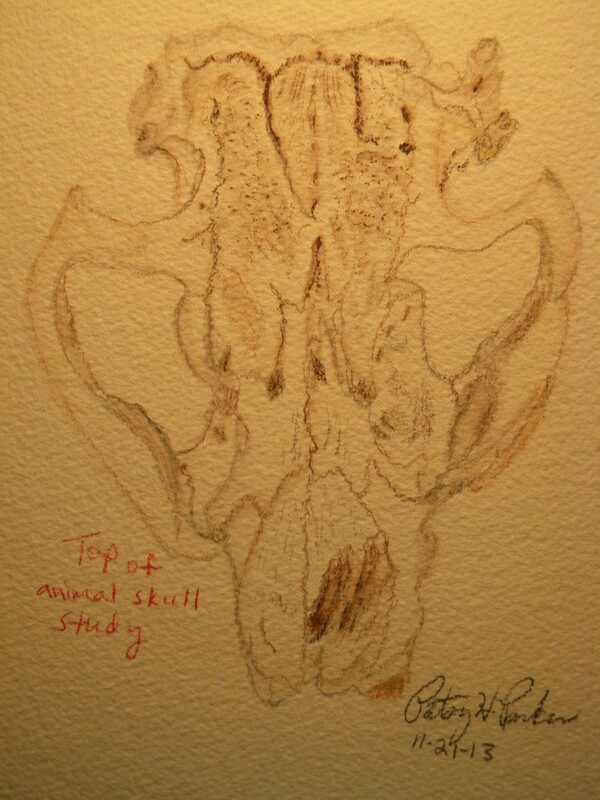 Here is a watercolor of the skull I found while I was out on the butte taking pictures last week. It is an incomplete skull, but the closest image I found on Google was of a Jack Rabbit which are very numerous here. I did this drawing while holding it up in the air with the top of the head facing me. Posted on November 25, 2013, in Art Talk and tagged art, drawing, painting, watercolor painting. Bookmark the permalink. 8 Comments. Beautifully done Patsy! Love a good skull! That will be a good one to do. Look forward to seeing it! That’s impressive. I’m curious, how long did it take you to draw? I’m not really sure! I think maybe a little less than an hour?? I have just recently started doing sketches of stuff. Usually I have a photo reference to draw or paint from that I spend a lot of time on. But I’ve wanted to do some sketches in watercolor and pencil lately to get more practice at it. It must have been difficult to draw while holding it up in the air. Nice job!